Geek's Guide to Britain There are two ways to approach Jodrell Bank. From the north you fly through the WAGish end of Cheshire, with towns like Wilmslow and Alderley Edge housing Manchester and Liverpool’s finest and their harems. I prefer coming from the south, under the Twemlow Viaduct, a 105ft high, 500 yard long symphony of red brick, completed in 1842. The road dips here, so that as you come under the bridge, you tend to hit the accelerator, before leveling out just in time to start catching glimpses of the Lovell Telescope across the fields as the road wobbles its way towards Macclesfield. It’s still eerie, suddenly seeing the dish pop in and out of the lines of trees carving up the tweedily rough Northern Midlands countryside. It’s as if the credits for countless popular science shows were being projected around you. You’re on Jodrell Time. If we all know what the iconic Lovell Telescope looks like, some of us might be a little fuzzy on what’s it’s for. To recap, its day job is to observe the Universe in the radio spectrum, and one of its early successes was in unlocking the secrets of quasars. But it also played a major role in the Cold War’s space and arms races, tracking the Russians’ first space shots, conveying instructions to US space probes, listening in to traffic from Russia’s probes and standing by to track incoming Russian ICBMs. 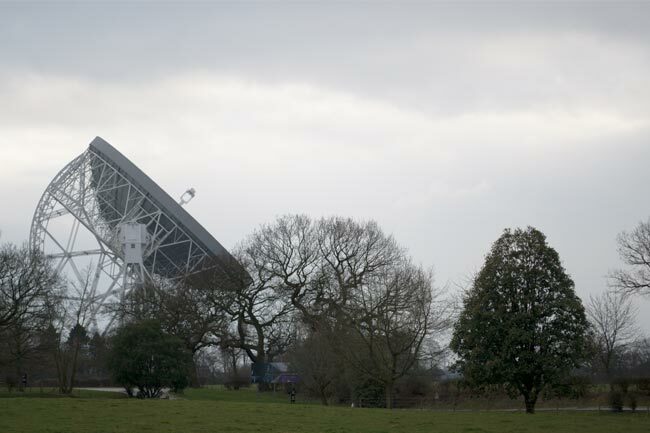 Radio Astronomy began at the site in the late 1940s, when the University of Manchester’s Bernard Lovell got sick of interference in the city, and hauled his collection of Army surplus radar kit to the Uni's out-of-town botanic gardens. He wheeled, dealed and otherwise pushed through the construction of the 76.2m Mark 1 dish which now bears his name. At the time it was the world’s largest steerable radio telescope. Six decades on, it’s still probing the universe, and is still the third-biggest steerable scope - on this planet, anyway. Arguably more important for the site’s future, it is also the project HQ of the Square Kilometre Array. This €1.5bn project will run a network of thousands of radio receptors across Australia and eight countries in Southern Africa, equating to a radio telescope dish one kilometre square. When it's up and running, it will be generating a bracing 960,000,000GB of data a day. But these days it’s not just enough to be relevant. You have to demonstrate it. Scream it even. And so things have changed a bit. The Jodrell Bank Centre for Astrophysics - to give it its full name - is not just a world class science site with a visitors' centre. The site has had a major makeover, and acts as the backdrop for the Beeb’s pop astronomy “Star Gazing Live” strand, runs a comprehensive programme of events to evangelise for astrophysics, and even hosts music festivals. Some of us might have memories of just pitching up to the site, wandering in from the car park and having a couple of sandwiches under the dish, perhaps contemplating our role in the cosmos, or simply trying to remember what we were doing at the family wedding we’d attended in Wilmslow the night before. The Planet Pavillion packs in a quick intro to space, with lots of astral lighting. And a shop. That relief pattern across the front of the building is actually a radio map of the universe, created at Jodrell Bank, and the motif is repeated throughout the park, reinforcing Jodrell Bank’s pivotal role in mapping the cosmos. Things get more detailed in the larger Space Pavillion, with plenty for kids to prod, listen to and grapple with. You can listen to the sound of the Big Bang, and then explain it to the kids. You can fondle a meteorite. Despite quite clearly being a lump of (mainly) iron this was strangely awesome, coming the week after the Russian meteorite shower. You’ll want to get the kids into the Science Show, and the Ask an Expert Session, which gives them the chance to discover there are real astronomers who are not Brian Cox. Or even Dara O’Briain. With about 150 on-site, and more to come as the SKA project spins up, you’re unlikely to get the same expert twice, even if you buy the full year pass at £60 for the basic family version. The sessions can go with a bang, literally, but we won’t spoil the surprise here. What you don’t get in either of the pavilions is a lot of history of the site or Bernard Lovell, the telescopes’ early successes in identifying quasars and pulsars, not to mention tracking the US and USSR’s jab-trading in the space race, and its role as part of the UK’s ICBM early warning system. This may seem unusual for something that is both grade one listed, and a candidate for World Heritage Status. This is a conscious effort on the part of the team running the site these days, with an urge to to carry out cutting edge science and act as a beacon for budding physicists trumping the temptation to lapse into the comforting arms of the UK heritage industry. Still the history is covered reasonably comprehensively as you walk around the telescope itself. When we visited it was whizzing around like a cosmic taxi driver’s head. Older than most Reg readers, it’s still the world’s third-biggest moveable telescope. In fact, it’s moving all the time to compensate for the Earth’s rotation. Having 3,200 tonnes of metal and railway bogey noisily spark into life just as you’re contemplating your place in the universe can be disconcerting. Almost as disconcerting is the ever-present threat of foam airpowered rockets. The site is riddled with them, part of the drive to give younger visitors a hands-on chance to play around with Newtonian physics. If you want a break from the cosmos or the kids, you also get to walk around the University of Manchester botanical gardens - the botanists are still here. As part of the makeover, there’s a new Galaxy Garden. We didn’t get to see the garden though, as we were treated to a rare behind-the-scenes tour with Jodrell’s associate director Dr Tim O’Brien. 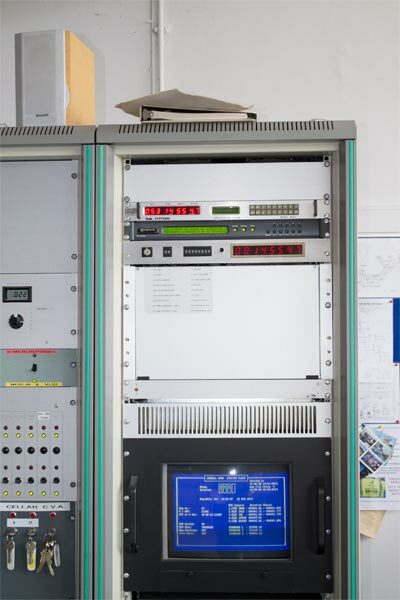 If the telescope itself takes us back through eons in space, a walk around the backrooms at the site will catapult you through a history of computing since the 1950s. We had a walk through the control building for the Lovell telescope. If you were at college in the UK anytime before 1990, you’ll be familiar with the 50s style academic architecture. The control room itself felt similarly familiar. At first glance it looked like a set from a '50s scifi classic, or a particularly well-funded episode of Doctor Who. All steel-grey chassis and post-war municipal functionality.